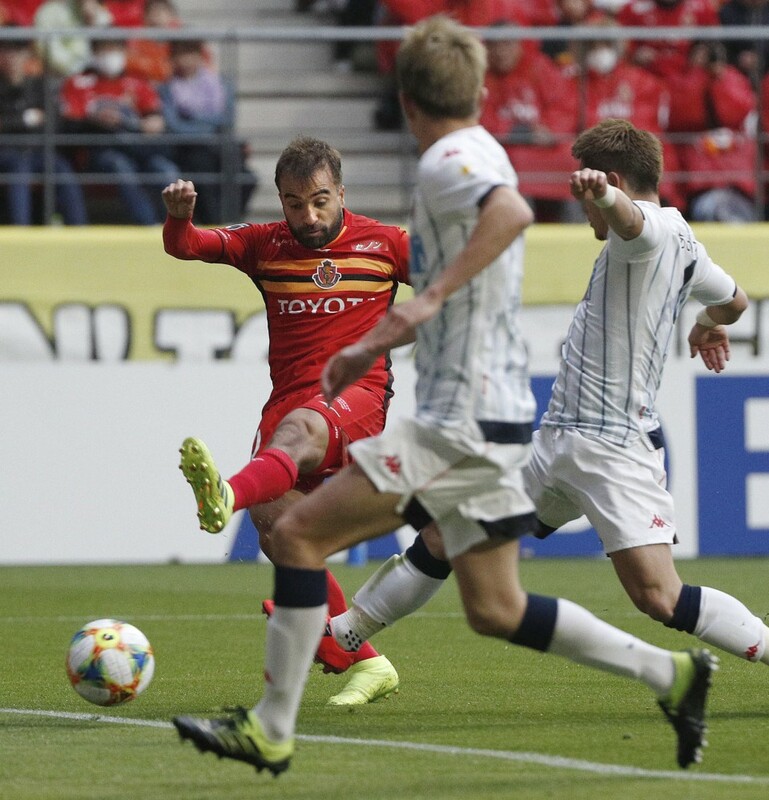 Brazilian playmaker Gabriel Xavier opened the scoring, then struck again early in the second half, as Nagoya Grampus thrashed Consadole Sapporo 4-0 in the J-League first-division on Saturday. Grampus were in control throughout the Toyota Stadium curtain raiser in front of 31,083, playing with their preferred pace as they counterattacked from deep inside their own half. Yahiro Kazama's men retook top spot with the win, their fourth of the young campaign, in a welcome turnaround after finishing last season in a battle to stave off relegation. Xavier opened his account for the season on a 17th-minute counterattack, tapping into an open goal after Sapporo keeper Gu Sung Yun parried an attempt from Ryuji Izumi into his path. The hosts doubled the lead 14 minutes later when Consadole defender Akito Fukumori turned the ball into his own net, botching a clearance as the visitors tried to repel another Grampus counterattack. Forward Ariajasuru Hasegawa made it 3-0 before halftime, chipping past Gu following a clever one-two with defender Yuichi Maruyama. Xavier struck again in the 50th minute, getting his first shot blocked but finding the net on the rebound after Brazilian striker Jo played him into the area on the break. The midfielder missed a golden chance for his hat trick in the 72nd minute, blasting over the bar after Jo had an attempt blocked from close range. "Aside from the two goals, I was really happy to get the win in our first game (of the season) at Toyota Stadium," the 25-year-old Xavier said. "It was a perfect match. I think it was our best performance of the year. But we can't be satisfied. We need to continue playing like this." The loss was the second on the trot for Mihailo Petrovic's men, who had key playmaker Chanathip Songkrasin and striker Musashi Suzuki returning from respective international duties with Thailand and Japan. In other first-division action on Saturday, Vissel Kobe came from behind to beat Gamba Osaka 4-3 after substitute Junya Tanaka scored twice in the final 11 minutes at a rain-soaked Panasonic Stadium. Having gone down 2-0, Lukas Podolski pulled a goal back for Vissel before assisting on David Villa's equalizer. Shu Kurata put Gamba back in front before Tanaka's heroics turned the match for the visitors. Urawa Reds salvaged a 1-1 draw late against visiting FC Tokyo, with defender Ryota Moriwaki equalizing in injury time to cancel out Diego Oliveira's opener. The result saw FC Tokyo relinquish top spot and drop to second in the standings. Sanfrecce Hiroshima moved up into third place by beating Oita Trinita 1-0 away on a second-half strike from Douglas Vieira. Cerezo Osaka won 2-0 away to Vegalta Sendai after goals from new signing Ken Tokura and Atomu Tanaka. At Yamaha Stadium, Kashima Antlers drew 1-1 with Jubilo Iwata after Leo Silva Asian equalized late for the Asian club champions following Masaya Matsumoto's opener.